A century-old 30-inch cast iron water transmission main recently burst in Portland, Oregon, leaving some streets in the northeast part of the city flooded with millions of gallons of water. Officials from Portland Fire & Rescue tell Willamette Week the pipe was leaking water at 1 million gpm. The pipe was first installed in 1915, and its age was a factor in the break, according to a Portland Water Bureau spokesperson. Workers fought the significant flow of water in an effort to excavate and replace the pipe. Two types of human-associated bacteria and three types of human viruses recently were detected in Milwaukee streams within the Menomonee River watershed, according to a study led by the U.S. Geological Survey. From 2009-2011, scientists with the USGS, U.S. Department of Agriculture and University of Wisconsin-Milwaukee sampled surface water from six Menomonee River stream locations in Milwaukee, Wisconsin, to measure human sewage contamination in the watershed. The scientists collected samples during periods of high water flow from rain, snowmelt or both, and periods of low water flow. They tested 228 samples for eight types of human viruses and for two types of bacteria that are associated with human waste. The study found that human viruses were present in up to 38 percent of the samples and human bacteria were present much more frequently in the samples. The three viruses detected in the study were adenovirus C, D, F, which was the most common and can cause minor respiratory illnesses; adenovirus A; and enterovirus, which can cause symptoms similar to the common cold. The scientists found at least one of these viruses in 20 to 73 percent of samples during low water flows and in 24 to 61 percent of samples during high-flow events, depending on sampling location. 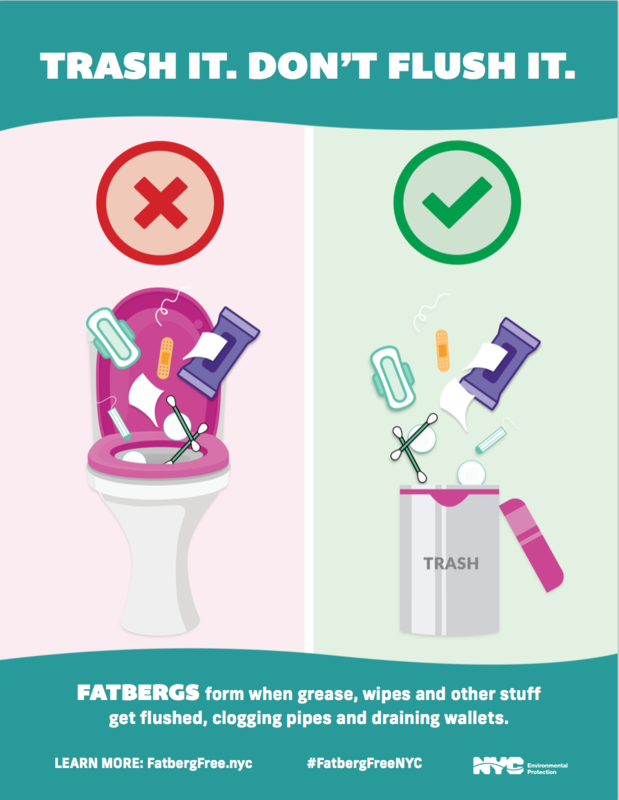 A new ad campaign is making its way around New York City that warns residents about the impacts fatbergs have on city wastewater infrastructure. The “Trash It, Don’t Flush It” advertisements reference the fact that the city spends $19 million in taxpayer’s money every year hauling unflushable debris to landfills.